Sedrup (formerly Southwarp or Southcote) is a hamlet in Buckinghamshire, England. 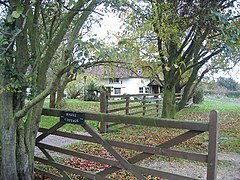 It is located south west of the town of Aylesbury, close to the villages of Stone, Bishopstone and Hartwell which also provide the name of the civil parish within which Sedrup lies. North Bucks Way going through Sedrup. Most of the hamlet is within the boundaries of the Sedrup Conservation Area. Sedrup contains 5 grade II listed structures. 4 of which are cottage and one a house. During World War II, Prisoner of War Camp No. 36 Hartwell Dog Track was located in Sedrup. It was known to house Italian prisoners from 1942 to 1946 and consisted mostly of tents with one hut. A 1946 RAF aerial photo of the site shows camp buildings at Grid reference SP797121 51°48′06″N 0°50′43″W﻿ / ﻿51.8018°N 0.8454°W﻿ / 51.8018; -0.8454, on what is now the Meadoway housing estate adjacent to Sedrup Lane. Remains of the camp were still evident on the site in the 1950s. These quaint thatched cottages are at the end of the no-through-road lane which leads to Sedrup. The drivable lane from Hartwell to Sedrup continues as a bridleway and long distance path - The Midshires Way and the North Buckinghamshire Way. ^ "Sedrup Conservation Area Boundary Revision Adopted". Aylesbury Vale District Council. 24 October 2012. Archived from the original on 30 December 2012. Retrieved 3 September 2017. ^ Sedrup Conservation Area CONSULTATION DRAFT. Aylesbury Vale District Council 2012. June 2012. pp. 46–47. Retrieved 2 July 2015. ^ England, Historic (1 November 2003). "Prisoner of War Camps (1939 - 1948) - Twentieth Century Military Recording Project" (pdf). Historic England. Retrieved 3 September 2017. ^ "POW Camps in UK - 1 to 50". Archived from the original on 21 January 2012. Retrieved 3 September 2017. ^ "Unlocking Buckinghamshire's past – Prisoners of war". Buckinghamshire County Council. Retrieved 3 September 2017. ^ "Unlocking Buckinghamshire's past – Hartwell Dog Track – including RAF aerial photos". Buckinghamshire County Council. Retrieved 3 September 2017. This page was last edited on 27 July 2018, at 06:39 (UTC).